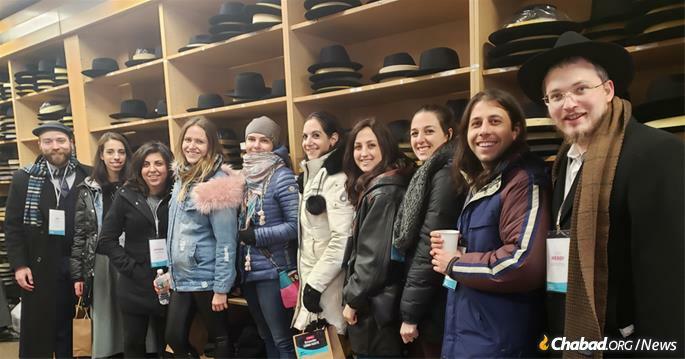 The visible group of young men and women crossed the street in the Crown Heights neighborhood of Brooklyn, N.Y., stopping at a shop called Primo Hatters. 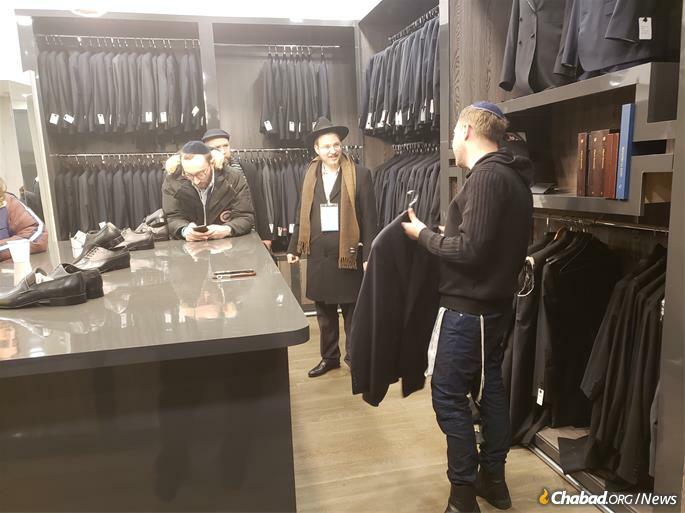 “This is where the rabbis get their gear,” said their guide, Rabbi Mendy Levertov. “To you, the hats may look the same, but they come in a variety of sizes, styles and prices.” The lot trooped up a narrow staircase to a recently renovated showroom where proprietor Mendy Sacho displayed custom-made kapotas, traditional long black silk coats worn by men on Shabbat and holidays. 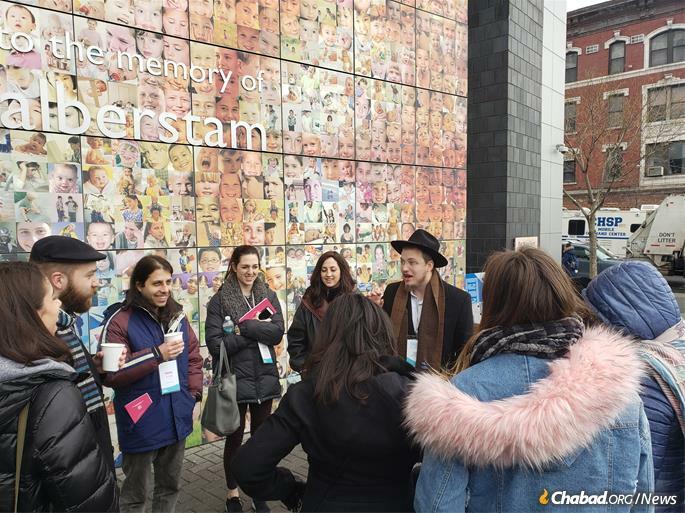 Levertov, who heads Chabad Young Professionals in Austin, Texas, was leading this group on a walking tour as part of a weekend dubbed “Encounter: Crown Heights; An Immersive Shabbat Experience.” The gathering was hosted by Chabad Young Professionals International, which provides social events, professional functions and spiritual gatherings for young professionals in 85 communities worldwide. The rabbi and his wife, Mussy, flew in along with six others from Austin who joined them for an insider’s tour of the “urban shtetl.” More than 200 visitors from 45 CYP communities were in town for the weekend, and on Friday, they split into five tracks for a look at the neighborhood: The Foodie, The Community Insider, The Artistic Spirit, The Scholar and The CYP Champion. What group was Levertov’s? “The Latecomers,” he quipped with a grin. They walked past synagogues and shops, past two men inflating a tire and some paramedics rushing to a call, until they reached a small, nondescript building sandwiched between an apartment complex and a busy thoroughfare. Descending a wrought-iron staircase, they entered a spacious lobby decorated with chic furniture, modern fixtures, scented candles and verdant greenery. 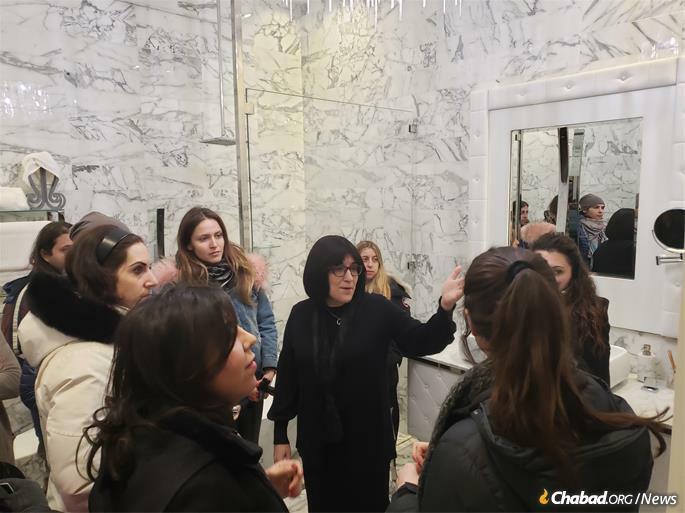 They had entered Mei Chaya Mushka, a contemporary women’s mikvah. An informative explanation on the basics of family purity was followed by a tour of the preparation and immersion rooms. 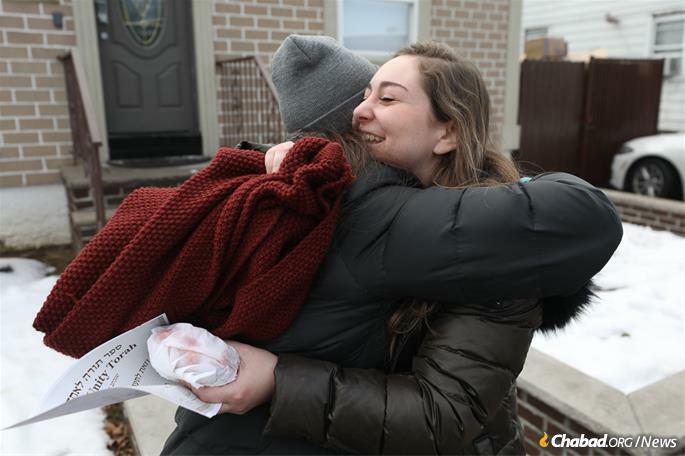 After a stop for some kosher pizza, they split up and headed to their hosts’ homes to prepare for Shabbat. As Shabbat began, Rabbi Mendy Kotlarsky, executive director of Merkos 302, got up on a chair as the crowd grew silent. He issued two challenges: the first, for everyone to meet at least one person from each location represented, and second, for everyone to take something concrete out of the weekend, committing to a resolution to better themselves and those back home. Soulful services, hearty meals, meaningful study sessions and engaging talks filled Shabbat day, and before long, the sky darkened. It was time to bid farewell to Shabbat. Dozens of candles glimmered in the room. Accompanied by guitars and drums, a musical Havdalah began. 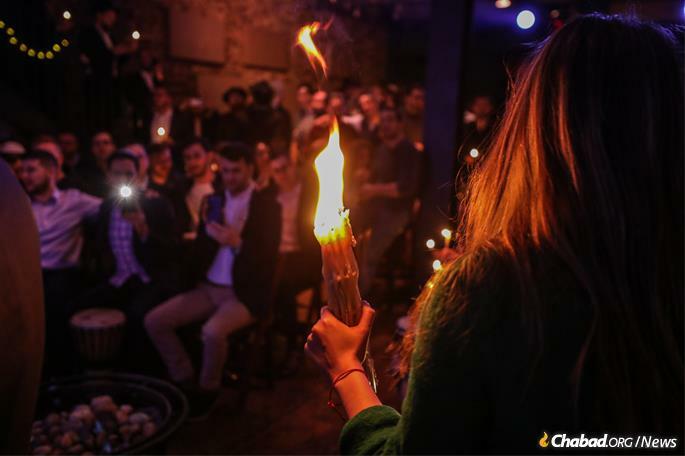 As the oversized Havdalah candle was extinguished in the remnants of the wine, and the room burst into dance. The Blocks moved to San Antonio (where the rabbi grew up) less than a year ago, but their nascent group is quickly growing. 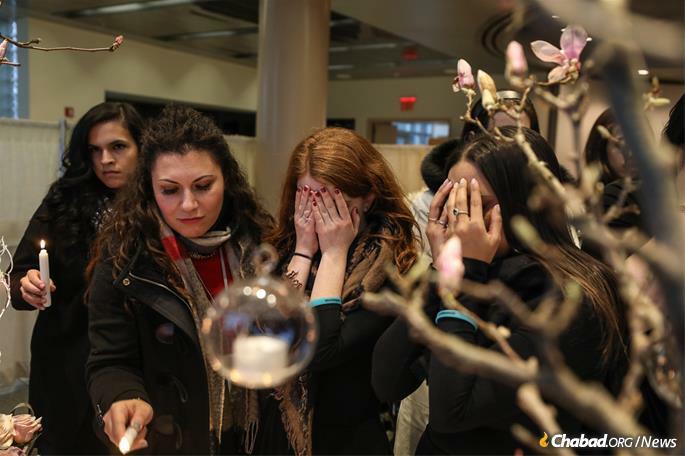 About two-dozen people join them for Shabbat meals, and eight came to New York for the Shabbaton. 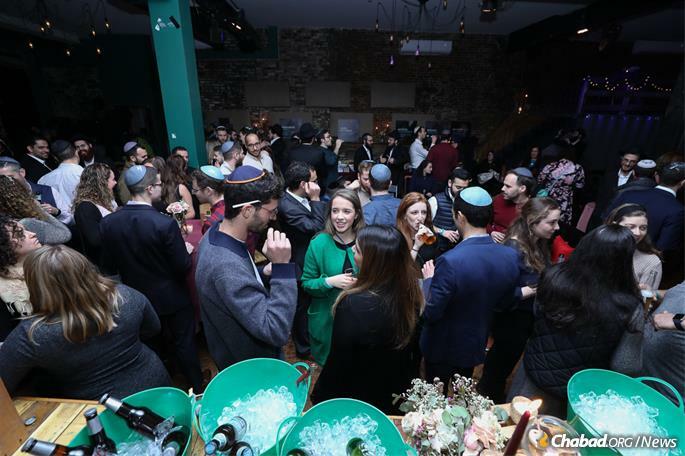 Like their constituents, the rabbis and rebbetzins who co-direct CYP chapters are mostly urban millennials, and their programs address their communities’ unique needs. The weekend was capped off on Sunday with a visit to the Ohel in Queens, N.Y., where the group joined in the ceremony marking the beginning of the months-long process of handwriting a Torah scroll. They each took their turns filling in a letter outlined by the scribe, making their mark on the unbroken chain of Jewish heritage. Cards were distributed, and those who had met the younger Kotlarsky’s Friday-night challenge wrote down their resolutions, placing them at the Rebbe’s gravesite. 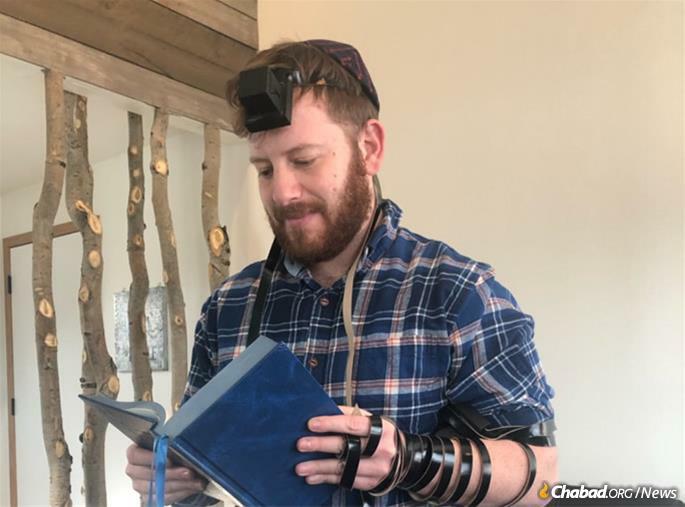 Silton, from Salt Lake City, resolved to put on tefillin each day.